London will also be the site of preliminary peace talks beginning this week. After more than nine months of fighting between Nigeria and the secessionist government of Biafra, the two sides agreed last week to meet there and try to pick a site for full-scale peace negotiations, probably somewhere in Africa. Any talks face formidable difficulties: Nigeria insists that Biafra rejoin the country and be split up into three states; Biafra demands that it retain some form of sovereignty in order to protect its 8,500,000 Ibo tribesmen. One good reason for talking now is that the war has reached an impasse. Nigeria's superbly equipped army of 85,000 men has captured all but one of Biafra's major cities, including the capital of Enugu, squeezing the rebel army of some 35,000 into an interior area only a third as large as the 29,000 sq. mi. that it originally held. Even so, because they fear genocide at the hands of the other Nigerian tribes if they are defeated, the Ibo stubbornly fight on. 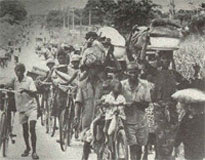 They have managed to hold Port Harcourt, Biafra's main port, and have fought a hard rear-guard action. 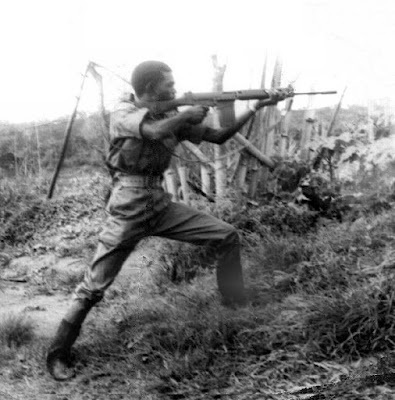 Frustrated by its failure to win a decisive victory, the federal government has tried to break the Biafrans by stepping up its bombing of their countryside, using Russian-supplied planes and bombs and Egyptian pilots. Without prelude, the rapid approach of a loud, metallic whine overhead transformed normal activity in the township of Umuahia, which now serves as the rebels' headquarters, into frightened cries and panicked running about. A few seconds later, a single low-flying jet plane cut a straight line across the town, releasing as it went six pairs of rockets. Two plowed caverns into the grass huts outside the Red Cross headquarters at Saint Stephen's School, where schoolgirl volunteers sat outside preparing garri for the evening meal. The teen-agers were killed instantly. After the raid, as I walked through the heart of Umuahia's residential quarter, a Ministry of Works dump truck had begun plying the streets to collect other victims. The scene I witnessed at Umuahia's Queen Elizabeth Hospital following the air raid was repeated in nearly every Biafran town I visited. Under tall shade trees outside an already filled mortuary lay a score of corpses, including pregnant women and months-old babies, charred, disfigured and mangled. Amid the tearful cries of keening women, workers carried into the morgue mashed human fragments piled on stretchers, and limbs and torsos balanced on shovels. The next morning, clutching handkerchiefs over nose and mouth against the stench and carrying freshly sawed unpainted wood coffins, the families lined up patiently under the trees to bear away their dead for burial. Though Nigerian Strongman Major General Yakubu Gowon insists that only military objectives are hit, the raids against civilians were, in fact, recently intensified to two-a-day strikes on all Biafran towns. During the six days I spent in Biafra, civilian bombing casualties totaled 300 dead by actual body count. I saw jets repeatedly release payloads on populated townships where not a single military installation was within range. Nigerian jets returning to their bases have even doubled back to strafe ci vilian crowds gathered at railway crossings, in village marketplaces and in a churchyard after morning services. 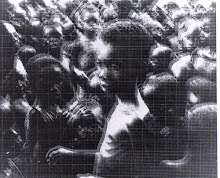 Nigeria's Egyptian pilots have so often bombed and strafed Biafran hospitals—whose roofs are often clearly marked with large red crosses—that Ibo mothers in some areas risk death for their seriously ill children rather than take them to such prime target areas. Since the air war can only be waged with outside aid, Biafra's Oxford-educated leader, Lieut. Colonel Odumegwu Ojukwu, 34, is understandably outraged at the Russians and Egyptians. 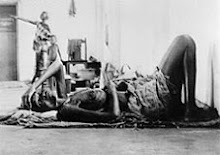 When I met Ojukwu on the evening of the Umuahia air raid in his closely guarded stucco house atop a hill outside town, he spoke of the "hot and cold flashes that go through my mind" when he sees the air raid victims. "Viewing their mangled remains on a mortuary slab," he said, "I feel anger with those who made devastating weapons available to primitive men. 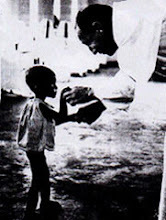 I even find myself wondering whether there is a God, and what has happened to the conscience of the world."